I always say that i think 7 inches is the perfect size for a tablet. But again and again manufacturers made me disappointed by making 10–inch notebook size tablet! Ok now the time for my next next perfect tablet is near. Samsung Galaxy Tab 7.0 Plus will be available from 13th of November in US. But if you are would like to wait fro three more days then T-Mobile will get the chance to give you a HSPA+ connectivity on their 4G network via your dual-core Galaxy Tab 7.0 Plus 4G. You need to pay $250 after a mail-in rebate and with a two-year contract. And you'll need to shell out twenty monthly interest-free payments of $10 in addition to your normal data plan. This new 7-inch 4G Android 3.2 Honeycomb tablet runs on a 1.2GHz Exynos CPU, has 16GB of internal storage and takes advantage of a 3MP rear-facing camera and 2MP front-facing cam for video chat. 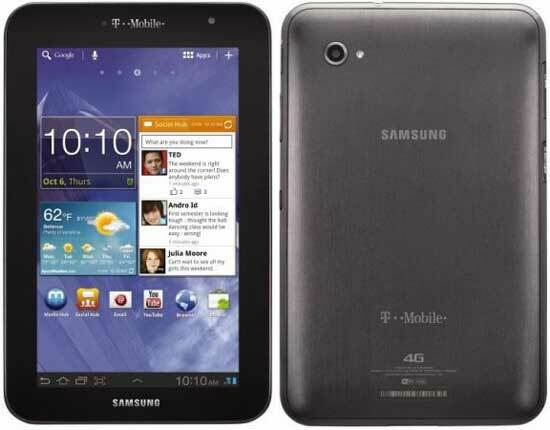 Now read the full press release to learn more about T-Mobile Samsung galaxy Tab 7.0 Plus 4G. T-Mobile's newest ultra-mobile 4G tablet delivers a rich entertainment experience anywhere on America's Largest 4G Network. BELLEVUE, Wash. - Nov. 8, 2011 - T-Mobile USA, Inc. today unveiled the ultra-mobile Samsung Galaxy Tab™ 7.0 Plus, the latest to join the company's portfolio of 7-, 9- and 10-inch 4G-enabled* tablets. Featuring a brilliant 7-inch multitouch display and weighing just 0.77 lbs., less than a can of soda, the Samsung Galaxy Tab 7.0 Plus is one of the thinnest and lightest 7-inch tablets on the market, making it easy to watch popular TV shows and movies, download full-color magazines, compete in multi-player gaming and more – all while on the go. Equipped with a 3-megapixel rear-facing camera with flash for photo, and Mobile HD video capture and playback in 720p** as well as a 2-megapixel front-facing camera which can be used to connect with friends and family via Video Chat, the Samsung Galaxy Tab 7.0 Plus makes it possible to connect and share life's most important moments while on the go. Beginning Nov. 16, customers can purchase the T-Mobile SpringBoard for a $179.99 down payment and the Samsung Galaxy Tab 7.0 Plus for a $249.99 down payment at T-Mobile retail stores. Each require a $50 mail-in rebate, with a T-Mobile Value Mobile Broadband plan, two-year service agreement, and 20 interest free monthly payments of $10 on approved credit. Overage-free Mobile Broadband Value plans start at $29.99 per month, and T-Mobile postpaid voice customers enjoy $10 off their monthly mobile broadband service. For more information, visit http://mobile-broadband.t-mobile.com/tablets. *T-Mobile's HSPA+ 4G network not available everywhere. See coverage details at http://www.t-mobile.com. 4G used in connection with the Samsung Galaxy Tab 7.0 Plus product refers to the fact that the Samsung Galaxy Tab 7.0 Plus is designed with HSPA+ technology. ***After mail-in rebate card with a T-Mobile Value Mobile Broadband plan, two year service agreement and 20 interest free monthly payments of $10 on approved credit.